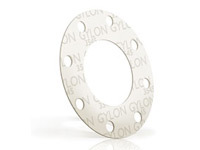 Garlock GYLON 3545 Microcellular PTFE outer layers with a rigid PTFE core. A high performance gasket sheet of microcellular PTFE outer layers with a rigid PTFE core. Ideal for use in low-load flange designs, such as glass-lined equipment, but still suitable for standard ASME raised-face steel flanges.